Welcome to the Trent Family! Need-to-know information about orientation programs designed to ease the transition to university life for you and your student. Practical advice on supporting your student—both before and after they arrive on campus. A quick reference guide to the services and supports available to Trent students. Reassuring answers to the questions and concerns that are most likely to be on your mind right now. 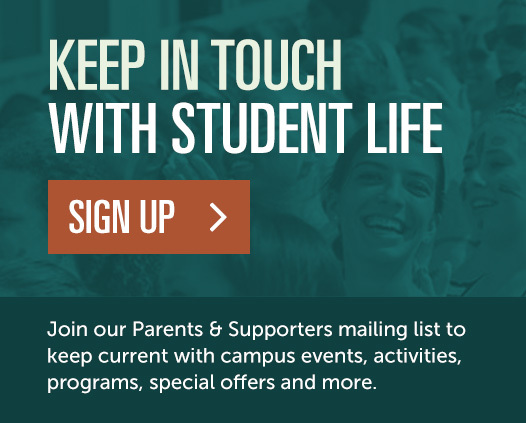 An invitation to stay in the loop about all things Trent by signing up for our parents and supporters e-publications. Looking for a way to keep yourself in the loop about upcoming events and/or important academic deadlines—things that matter in the life of your student? Eager to learn more about what you can do to support your student’s success behind the scenes? Sign up to receive regular Trent e-publications—for friends and family members. Can’t wait for the first issue of your newsletter to arrive? Check out our answers to these frequently asked questions in the meantime or, if you prefer, simply drop us a line. We’d love to hear from you.